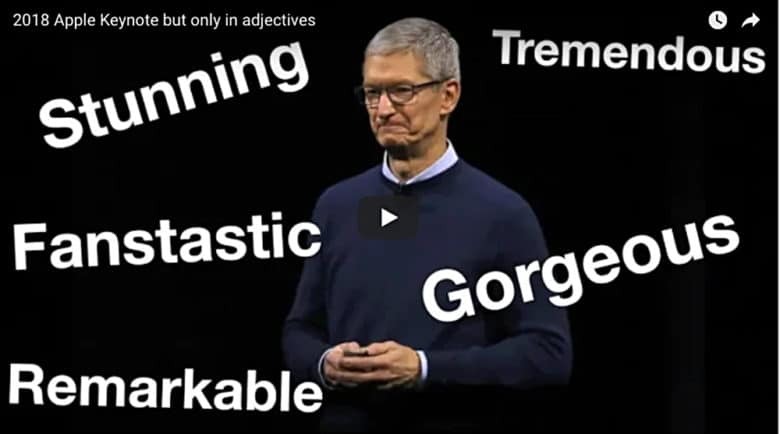 Apple tends to have its go-to buzzwords and as any fan who has faithfully watched product launches over the year, the words are easy to guess: beautiful, incredible, amazing and stunning. “Don’t get me wrong, I’m a huge Apple fan, and I can’t wait to upgrade,” Brown writes for the YouTube post. “I’m just making a funny observation. Often, active users of Twitter comment in real time as something gets said. This year, a couple of bloggers chided Phil Schiller, vice president of worldwide marketing, for mispronouncing the word bokeh, a Japanese word and photo term that refers to the quality of the out-of-focus parts of an image. Apple has made bokeh a familiar word because of how the iPhone’s portrait mode blurs the background behind the subject. The superlative count this year far exceeds the total from 2010. Jobs was rolling out a single iPhone. This year’s launch included three phones and several speakers discussing various features – which likely led to the increased use of adjectives. No matter, each word had a familiar ring. The iPhone 4, by Brown’s count, was ushered in with 28 adjectives. Amazing and beautiful were said six times while awesome was uttered five times. The XS line received 129 adjectives. Incredible was said 20 times; beautiful, 18; better than ever, 12; amazing, best and remarkable, 9; better, 6; and awesome, 5. Brown also posted the video on Reddit where one reader used a little math to determine the cost of each adjective has gone up in price. Brown’s video on Reddit quickly started conversations. Others like zingw were a little more critical.